Classical Free-Reed: Mr. Adler, I enjoyed very much your performances this weekend. How did you like working with the Pittsburgh Symphony? Adler: I've never had as much fun working with anybody as with Marvin Hamlisch. He is an angel and if it weren't for him I might have easily cancelled the concerts because of the sheer pain of walking. I'm eighty-three years old, you know, and have an arthritic knee; that's why I sit during my shows. Marvin and I just tell jokes to each other and occasionally some music creeps in! These concerts have been like no other concerts I ever gave. CFR: Is that because of Maestro Hamlisch? Adler: Yes, Marvin and I have such a rapport; it's incredible. I hope to do a lot more concerts with him; we're doing one October 25th in New York and we're doing New Years Eve in Chicago. I'd like to do as much as I can with him because he takes all the stuffiness out of giving concerts. I met him last year in London and took him to dinner and told everyone that he's the only man I ever met who can talk more than I do! CFR: Will you please tell how you first played Rhapsody in Blue with George Gershwin? Adler: I was at a party in New York in 1934 when the host, Jules Glaenzer -- the president of Cartier Jewelerssuddenly announced that Larry and George were going to play the Rhapsody in Blue. Glaenzer didn't even know if I knew the Rhapsody, but he announced it anyway. I had never played it before, but I had heard the piece, so I was confident that I could play it. So George sat at the piano and I started to play the Rhapsody, and it was as if two people had known each other all their lives; we played the Rhapsody all the way through and when we finished it, George got up, put his hand on my shoulder and said, "You make the god-damned thing sound like I wrote it for you!" From then on I was friends with the Gershwin family for the rest of George's life and for the rest of Ira's too. CFR: Did the Rhapsody become your theme piece? You played it last night with the Pittsburgh Symphony Pops and it is also on your latest CD. Adler: No, not really, although I'm playing a lot of Gershwin lately, what with his centenary coming next year. CFR: Was the Vaughan Williams 1952 Romance for Harmonica and Orchestra the first big classical piece for harmonica? Adler: It was, but curiously enough, there were two classical works written before that, by an unknown composer named Jean Berger and the other by Darius Milhaud, a very prominent 20th century composer. CFR: Was that piece Milhaud's Suite Anglais? Adler: Yes, but more attention was paid to the Vaughan Williams piece because he was a kind of Emeritus Professor and God in England. When we played it at the Proms at the Albert Hall Malcolm Sargent conducted it and for the first time in the history of Albert Hall, a new work had to be encoredplayedtwice, it had never happened before, nor since. CFR: That was the very first piece I ever heard featuring the classical harmonica; Karl Haas programmed it during one of his Adventures in Great Music programs. 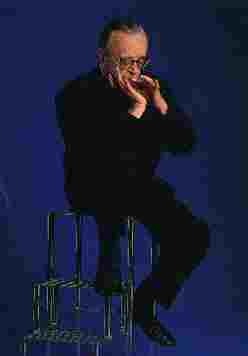 Adler: I was very pleased that Vaughan Williams did straight Vaughan Williams, he made no concessions to the fact that he was writing for a harmonica; he just wrote a straight musical composition. CFR: The Romance is a beautiful piece. How did Darius Milhaud come to write Suite Anglais for you in 1942? Adler: I did a concert with Pierre Monteux with the San Francisco Symphony and Darius Milhaud at the time was teaching at the University of Berkeley. He came backstage and said that he would like to write a work for me, and he did. CFR: Before 1942 what pieces did you play at your concerts? Transcriptions? Adler: Yes, I played the Vivaldi violin concerto, the Bach A Minor violin concerto, the Marcello oboe concerto, and I played short pieces by Fritz Kreisler, by Albeniz, and, of course, I played the Rhapsody in Blue and the great standards by songwriters like George Gershwin, Jerome Kern, Cole Porter and Richard Rodgers. CFR: Our focus is on classical music. Do you have any other interesting stories about the harmonica in classical music? Adler: I'll tell you something very funny. Around 1947 I played at the New York City Center. Villa-Lobos heard me and although we hadn't met, he gave a statement to the press saying that the harmonica was the instrument of the future and that he would write a concerto for Larry Adler. So I met him and I showed him the various possibilities and limitations of the mouth organ. Then I waited, and waited and waited, yet nothing appeared. About two years later I heard that he had written a concerto for the mouth organ and given it to another mouth organ player: John Sebastian! Adler: So I was in Paris, and Villa-Lobos was in Paris also, so I called him up and he invited me to lunch. I said, "Heitor, didn't you promise to write a concerto for me?" He replied, "Yes! I wanted to write it, I was waiting!" I said, "Waiting? Waiting for what?" His smile illuminated the Champs Elysees and he replied, "the money!" CFR: So Villa-Lobos did write a concerto, but he wrote it for Sebastian! Adler: Yes, but now John's dead so I'll be playing the work. CFR: How many other classical mouth organists are there besides you and Sebastian? Adler: Well, there's Robert Bonfiglio, and Tommy Reilly in England, Claude Garden in Paris, and quite a few in Tokyo. Adler: Oh, yes, that is a big country for harmonicas. China also. CFR: What advice do you have for young players of the instrument? Adler: I would tell them: learn some Bach. I think all of the Baroque composers like Bach, Vivaldi, Scarlatti, Marcello, etc., they're very good for the aspiring mouth organ player because they write beautiful melodic lines. What I don't like is a mouth organ player who tries to be as clever as he can be. Try to make music; to hell with being clever! And I don't like the blues harmonica at all; I think they all sound alike except for Bob Dylanwho sounds worse! CFR: Is that something that I can quote? Adler: Oh, absolutely! I've said that if I were dictator of the world my first act would be to forbid Bob Dylan from playing the mouth organ! God, I think he's bad! CFR: I must admit, few people have heard classical music on the harmonica. It is very rare, like classical music on the accordion. Adler: The blues mouth organ is cheap, my mouth organ costs 3500 pounds, and there aren't many players who can afford that. CFR: I understand you play a Hohner instrument. When did your relationship with Hohner begin? Adler: It began when I was a teenager. A teacher was sent to the United States from Germany by Hohner to form a group of mouth organ players and he organized the competition which I won. Three months later I ran away from home and went to New York. From then on, I have been in touch with the Hohner people wherever I played and, in fact, I visited them in Germany in the early 1930s. I those days I didn't even know that there was a Nazi movement! Incidentally, Yamaha makes an excellent harmonica and there's a very good firm in Brazil called Hering and also China has a thriving mouth organ industry now. CFR: I've ordered a copy of your autobiography "Me And My Big Mouth" published by Blake Publishing. Adler: That's a lousy book and I don't like it; it's ghosted. There was a real autobiography that I did write and it's called "It Ain't Necessarily So." That one I did write and it was published by Collins. However it's out of print and the only way to get it is from the libraries. "Me And My Big Mouth" has a certain amount of factual material but the author completely missed my style and my voice. That's why I hate the book. CFR: Can you recommend some of your classical CDs? Adler: At the moment there are five CDs available. First of all, there's the one that you have in your hand: "The Glory of Gershwin" on the Mercury label, which by the way has sold two million copies. Adler: This CD put me in the Guinness Book of Records for being the oldest performer to release a hit record; I was 80 at the time. I have three classical CDs released by a company called Prestige in New York, one by Pulse (also in New York), one by EMI and one by ASV/New Era. There is quite a bit which hasn't been released yet; RCA has several classical albums and so has EMI. CFR:It has been absolutely wonderful talking with you Mr. Adler. I can't think of anything else to say besides thank you very much. Adler: Not at all! Glad that you called.